The Neroli & Rose Damask Body Wash from Elemental Herbology is a soothing and pampering SLS free body wash infused with pure Orange Flower Water, Evening Primrose and Rose Oil to gently cleanse and purify dry skin. 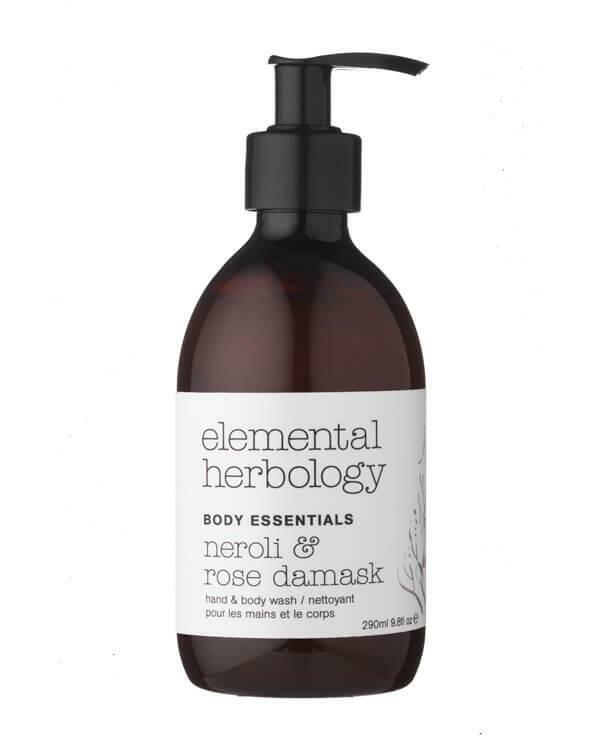 Apply the Neroli & Rose Damask Body Wash from Elemental Herbology to damp skin, massage into your skin and rinse well. Ingredients: Aqua (Water)*, Cocamidopropyl Betaine*, Coco-Glucoside*, Lauryl Glucoside*, Sodium Lauroyl Methyl Isethionate*, Phenoxyethanol, Citrus Aurantium Amara (Bitter Orange) Flower Water*, Linalool*, Aloe Barbadensis Leaf Juice Powder*, Benzyl Alcohol, Glyceryl Oleate*, Sodium Benzoate, Limonene*, Glycerin*, Hydroxypropyl Guar Hydroxypropyltrimonium Chloride*, Panthenol, Parfum (Fragrance), Citric Acid*, Geraniol*, Dehydroacetic Acid, Phytic Acid*, Citrus Aurantium Amara (Bitter Orange) Flower Oil*, Magnolia Biondii Flower Extract*, Farnesol*, Oenothera Biennis (Evening Primrose) Oil*, Rosa Damascena Flower Water*, Potassium Sorbate, Citrullus Lanatus (Watermelon) Seed Oil*, Ximenia Americana Seed Oil*, Hydrogenated Palm Glycerides Citrate*, Tocopherol. *Ingredients derived from 100% natural source. The product is free of mineral oils, synthetic fragrance and color, sulfates and paraben preservatives, and it’s not tested on animals. Elemental Herbology has one mission: to bring your skin to optimal health and vitality. With the help of therapeutic concentrations of natural and organic plant and herbal extracts, essential fatty acids, vitamins, minerals, pure essential oils and antioxidants, Elemental Herbology has been developing advanced natural facial and body care with advanced nutrition for the skin since 2008. Elemental Herbology bases everything it does around the Five Elements Theory because a balance of all the elements (wood, fire, earth, metal and water) is needed in order to provide the ultimate nutrition for your skin, depending on your skin type, environmental factors, lifestyle and the seasons.